East End Pioneer: You say doner, we say donair! You say doner, we say donair! As Pioneer was meandering down a sunny stretch of Danforth last Thursday afternoon, a handwritten note saying "Grand Opening" posted in the window of a once-sketchy store front caught our eye. Our first impression was relief - it's always great when something new opens on this strip. 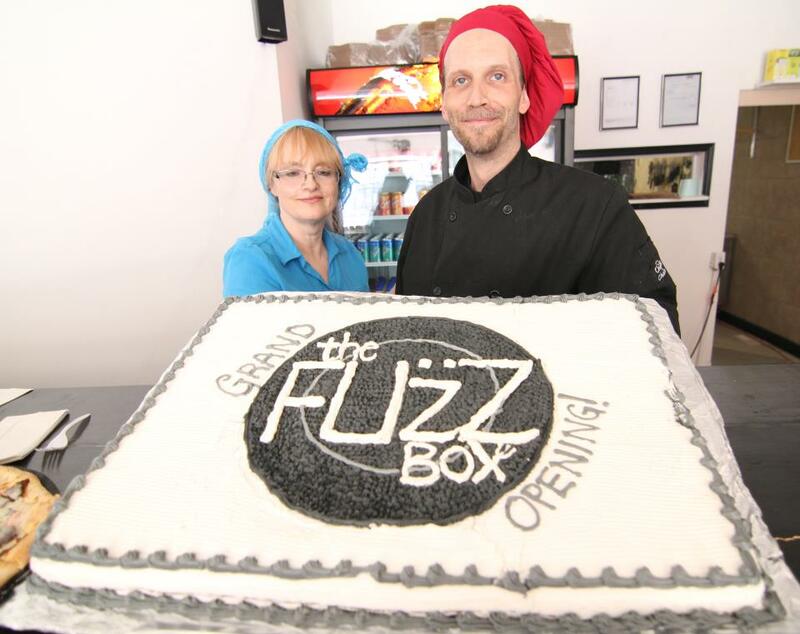 The place is called The Fuzz Box (1246 Danforth) and what piqued our curiosity was the sign saying they specialize in Nova Scotian donair. Pioneer had never experienced a donair before and not wanting to miss any kind of a party where there might be cake, we decided to head in and check it out. Inside, we got our cake and a sample of donair as well. What is a donair, you ask? The new restaurant's owner Neil was behind the cash and he explained that it's basically an east coast version of a Greek doner kebab with meatloaf instead of gyros. The meat is served warm on a pita or flatbread with a sweet sauce and other toppings (when I asked an east coast neighbour about what she thinks the sauce is, she said "I don't know, but it's super yummy!!). It definitely seemed a random choice, to locate a donair diner on a downmarket stretch of the Danforth, but as Neil explained, while doing his research he discovered that there are a lot of east coasters living in the area. In fact, as I was inside talking, at least two ex-pat Nova Scotians came in to ask about the donair and whether Neil would be serving lobster (he won't just yet, but he did have a mean clam chowder on the burner!). Yum...east coast comfort food...this could be the start of something new! Perusing the take out menu, it looks like the prices are reasonable and there's a good selection of items, so next time you reach for the phone to call Pizza Pizza, try some donair instead. Plus, readers of East End Pioneer get a 10% discount if you mention that you read about The Fuzz Box here. Oh my! That's just right around the corner from me. 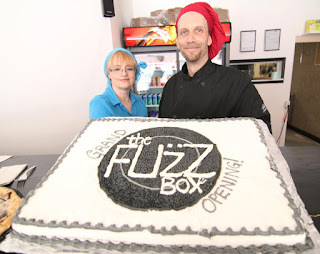 Didn't find a website for The Fuzz Box, so I wonder about their hours. I've never had a Nova Scotian Donair, and now I think I will have one for dinner (if I catch them open). Thanks for the discount, EEP! I think this is awesome! I've wanted to try a donair since watching Trailer Park Boys. Had one last night. Ohhhh... so good. It was spicier than I expected and the sauce was amazing. The owner (Neil) was really cool and friendly, too.